This is the first time I use the orange top, not bad at all. Why I never try to use more orange because I'm afraid orange won't match with my skin color. Another reason why I'm so excited to wore orange is because someone that I like love orange color and because I already bought this top for a long time ago and I never wore it too, so I try to make a post about this orange top and voila! I think orange is not as bad as I think before. By the way, say hello to my new sponsor, have you ever heard about Jiglys? 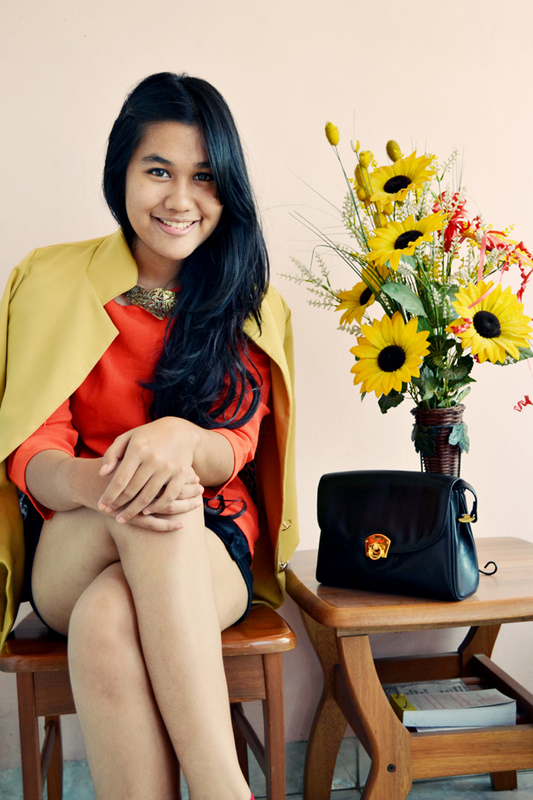 a fashion brand based in Bandung, Indonesia. They have a lot of stunning collection, check it out here. Guess what? I have one from their stunning collection, Plaited Collar Necklace. 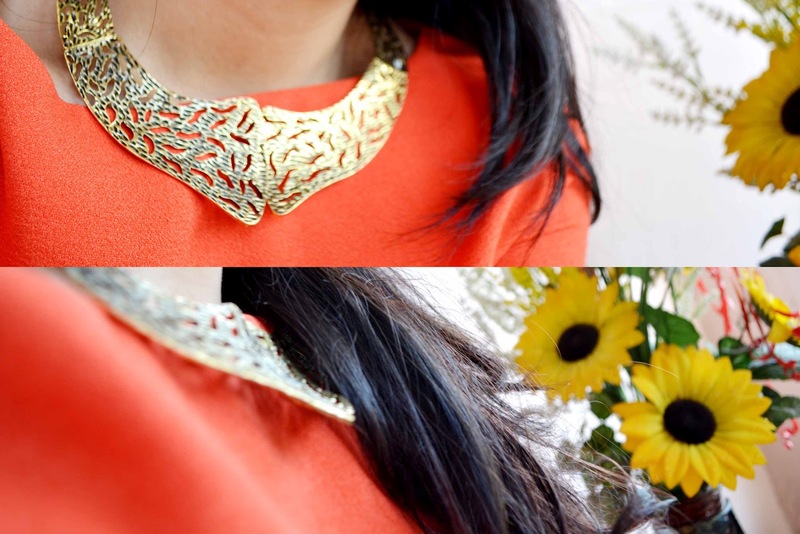 The necklace made of alloy, featuring collar shaped design, unique details and plaited design. What are you waiting for? Go visit and shop there! I reiterate you once again, no regret after you have some of their collection, trust me, limited! here the details, amazing huh? 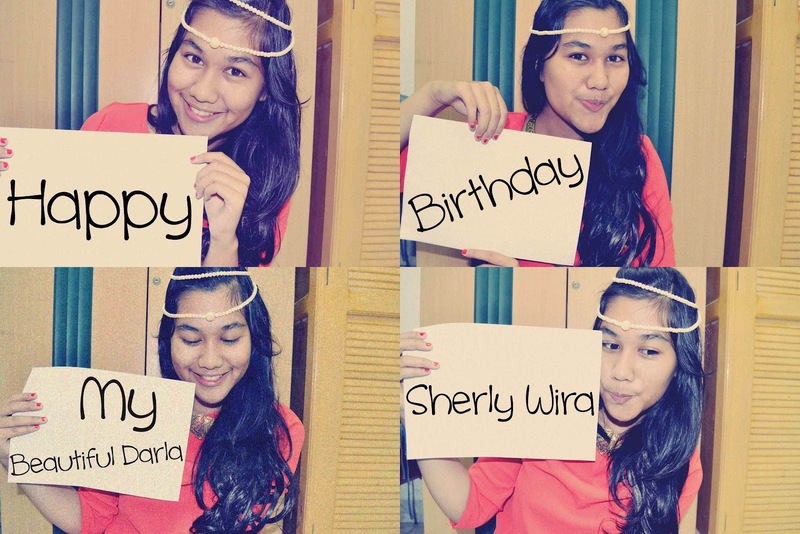 Last...Happy Birthday to my pretty dear, Sherly Wira, my best friend, my another mom, my my my shoulder to cry on and my everything, not easy to build a friendship for 4 years, we've seen as a family and I miss her so bad! 19th not too old, just close to 20 ;p some sneak peek for her, I wore the same top and same necklace but with a few complementary hahahaha I just like to use something on my head and taraaa here's the pic! and i want your hair so bad!! Love that orange on you! And the yellow blazer is adorable!!! And thanks so much for stopping by my blog! You look so classy and fab!! i love your headpiece in those last picture!! and a very happy birthday to your good friend! and i love your outfit, girl! love the contrasting colours and you have very beautiful, healthy hair hah! We love the colors U matched together. Gorgeous shoes. ADORE how you'v emixed orange with greeen! you have nothing to fear - orange goes wonderfully with your skin tone, and I especially love how it looks against your dark hair. You've got such a pretty smile! These pictures are gorgeous. And that purse is perfectly classic. it would go with anything. Great posing next ot the flowers too! They really go well with your summery and colorful outfit. I love yout outfit! you look stunning and the colors really look good on you. The lay out of your blog is also great, i'm glad i found your blog! maybe you like to follow each other? Let me know on our blog:) we follow you for sure! You look beautiful! Cute shoes. Like the blazer and your hair! You look so cute :) Would you like to follow each other here and on Bloglovin? Aww this is such a great blog post, I really do love your style and I definitely going to follow you !! Hope to see more of you soon!! i love all of this ! the blazer the shoes! the color with the top! Cute pics and your hair is just gorgeous. You look so cute in orange! 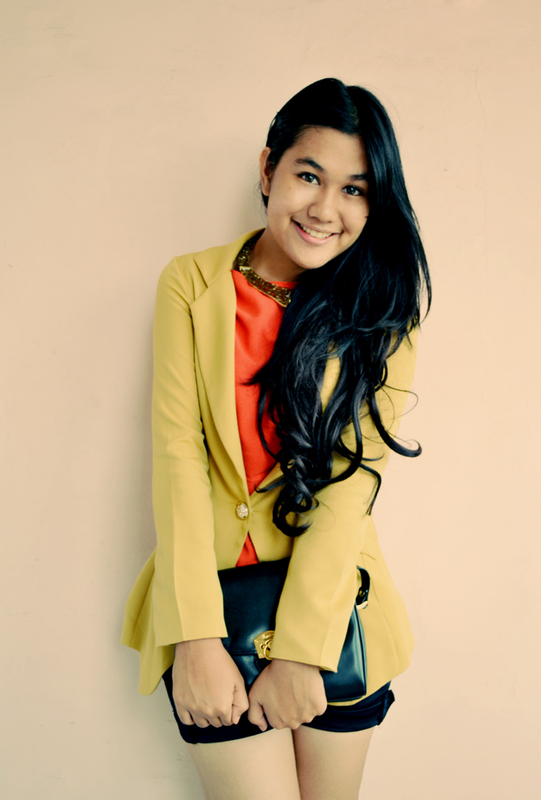 Love how your paired the orange top with the yellow blazer! I love all the colors! You look so chic. I am following you now :) If you like check out my blog and maybe we can follow each other? awww cute !! you're so fresh i love the color and your hair!! Love the color combination! Stunning! You look good in that shade of orange ! Pretty chic! Bold color. Orange fit you well. Nice to find your blog. I'm following you now! I hope you follow me too. lovely photos! 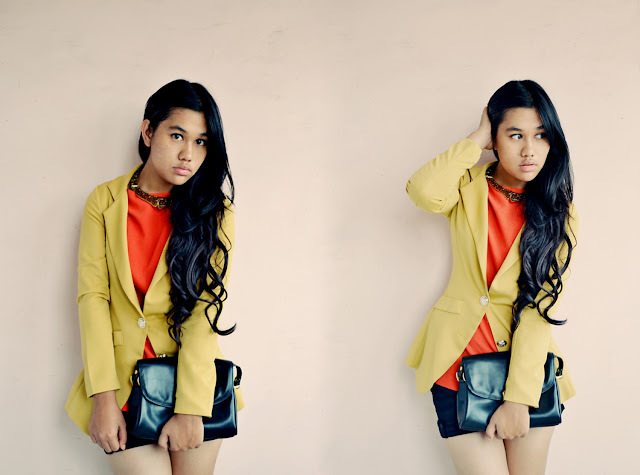 your hair is awesome and lovely blazer! I love the warm colors here. They look great together! Such an adorable colored outfit! omg i love this outfit! amazing, great colour styling! omg. all outfits looks amazing and cute *-* you are a beautiful girl. Great look! I love the orange top paired with the yellow jacket (I love colour block) and the bag's amazing! You're blog is really full of interesting outfits. Hope you'll check out my blog, too!